As we witnessed from many post-socialist cities in Eastern Europe, Russia, and China, economic growth and political transition [have] supplied the formula for exceptionally radical and quick transformations of a city. Since adopting market-oriented systems, post-socialist cities have become “blue oceans” for new investments. Pyongyang, the capital city of North Korea, is one of few socialist cities in the world that has not adopted this new economic model. On the other hand, Pyongyang is comparable to socialist cities of decades ago, in that it exhibits a strong potential to attract huge investments if and when it begins to open its market to other countries. This change has, in fact, already begun to take place, raising the following questions for architects: 1) what growth model can be suggested? 2) where will the new developments be centered? 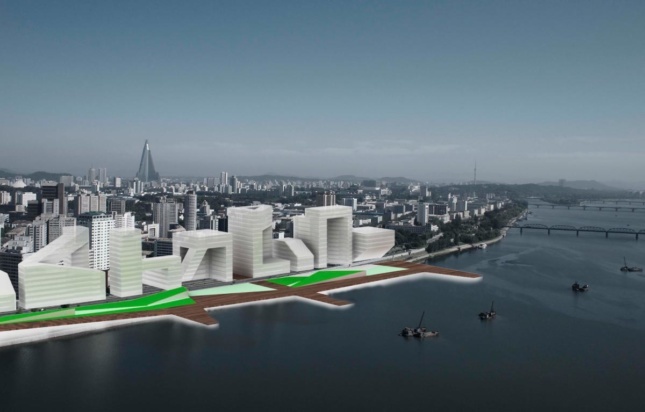 3) will the urban transformation replace or arise from within the existing structure of Pyongyang? In spite of recent developments in its fledgling tourist industry, North Korea is still the most enclosed country in the world, and even Pyongyang, its capital city, remains under a veil. The information we currently have about Pyongyang primarily comes from media discussions of its political or social issues. In contrast to reports of its dictatorship, nuclear weapons programs, and the trend of nationwide starvation, the actual urban layout of Pyongyang has not received much attention. Pyongyang, however, was considered by other socialist countries to be an ideal socialist city when it was first built during the 1950s, instead of to be a city of veil or dictatorship. In the absence of the political dictatorship of today, Pyongyang provided an experimental field in which socialist architects attempted to apply their ideal urban structures to the real world. In the aftermath of the Korean War (1950-1953), Kim Il Sung, the leader of North Korea, decided to keep Pyongyang as the capital city of the DPRK (North Korea). Its layout reflected the ideology of socialism as well as [the] victory of the war. Left in complete shambles after the war, the reconstruction of Pyongyang afforded planners the rare opportunity to create a new structure from the ground up. Thus, in order to fully understand the urban structure of Pyongyang, it is necessary to first consider the larger context of the model socialist city, its historical context, and how it differed in key ways from the capitalist city model. After three years of fighting in the Korean War, North Korea started to rebuild its cities through its first three-year reconstruction plan from 1954 to 1956. During this period, several socialist countries supported the reconstruction of North Korean cities by providing resources as well as technological assistance. Pyongyang received support from Hungary and Bulgaria, and not surprisingly, the architectural style and urban structure of Pyongyang showed some similarities to the two countries at the beginning of reconstruction. Based on a master plan in 1953 that reflected the ideals of socialist city planning, Pyongyang was planned as a one-million population city that would stretch from the Daedong River to the Botong River; the density of city was to planned as 20 percent to 25 percent. This scheme captured the socialist concepts of constructing a proper city in a well-planned way. 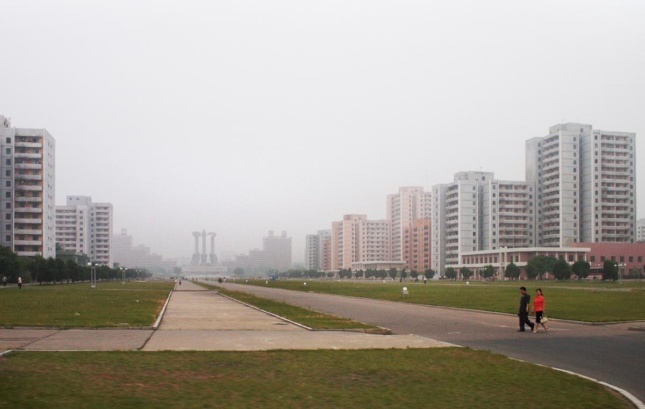 Throughout the decades, Pyongyang realized a number of its socialist urban planning goals. The three major socialist urban morphologies mentioned above were well executed in the city. To resolve disparities between cities and to balance development between urban and rural area, [the] architects of Pyongyang aimed to set aside self-productive units within the city. Today’s Pyongyang continues to be planned based on a unit district system that combines the industrial and residential so that residents can both produce and consume their products. 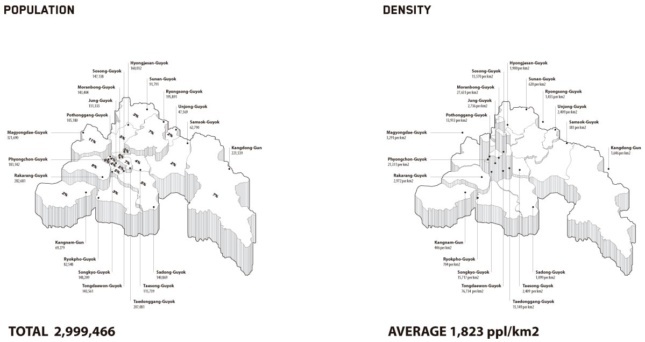 The density of population is planned at around 300 to 600 residents/ha. This district is well structured in the area across from the central administration district, and the two areas together comprise a key axis of directionality for city expansion. As North Korean leaders insisted that Pyongyang be developed in [a] well-balanced way in contrast to any other capitalist cities in the world, architects carefully injected landscape features into the city. Both riversides were developed major landscaped areas and most major boulevards were heavily planted. Additionally, to maximize the effectiveness of labor and production for workers, they created several leisure parks in the city so that the public could have enough rest and recover before returning to production. In Pyongyang, most of the leisure parks were located close to historical or memorial areas. The central part of the city was structured as a place for administrations and institutions. Major socialist buildings and symbols are located in this area, and the main square, Kim Il Sung Square, is also located there. Juche Tower, which is a symbol of North Korean ideology, is located directly across the river from the square. Together they create a major axis of symbolic spaces. Moreover, additional symbolic buildings and statues are distributed all around Pyongyang in order to serve as physical sites of propaganda for socialist ideology. Pyongyang was reconstructed based on the master plan that was designed by Kim Jung Hee in 1953. In the master plan, Pyongyang is structured as a multi-core city. Several different symbolic spaces are distributed evenly throughout the city and each of them become a core of each district. Also, main landscape structures are planned in between districts and work as buffer zones so that they cannot expand freely. This distribution of districts is mainly done to maintain the proper size of the city and to prevent social differentiation that can emerge from marked development in distinct areas. At the same time, each distributed central square works as a symbolic space that testifies to the centrally controlled society. In the 1960s, Kim Il Sung ordered the re-development of an architectural strategy of Pyongyang. Unlike the 1950s when development was more focused on [the] reconstruction of infrastructures based on a master plan, the new wave of development focused on five features that would propagate its society as well as its victory in war. They consisted for the expansion of the major boulevards and the construction of high-rise residential buildings along the boulevards, large-scale civic and cultural facilities, symbolic statues and squares, and leisurely and convenient facilities for foreigners. Once proposed, these five strategies became a major urban development standard with the larger scheme of the master plan in 1953. However, some of [the] schemes conflicted with the master plan. For instance, focusing on the development along major boulevards clashed with the development of several multi-cores. Major boulevards branched out of [the] central developed district and dense high-rise residential buildings came to be located along them. Consequently, this destroyed the multi-core system and only certain areas located near the start of the boulevards could function as core-like districts. Also, denser development of certain areas conflicted with the principle of evening distributing residents around Pyongyang. Additionally, even symbolic urban spaces came to congregate in the central part of the city instead of being distributed throughout the city. This phenomenon resulted primarily due to of the rapid growth of the city. Although North Korea, like other socialist countries, controlled migration of the population, it could not halt illegal immigration into the city and rapid urbanization of Pyongyang. As the city grew denser, housing shortages became a problem. To resolve this problem, as mentioned above, Pyongyang developed several high-rise residential areas. 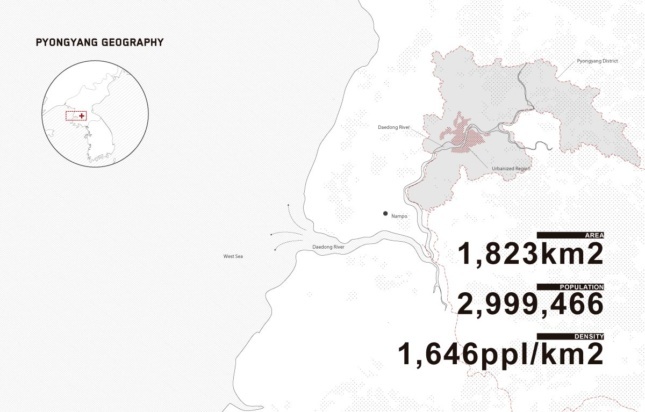 At the same time, informal residential areas emerged. They mostly arose in areas originally planned as landscape areas in the 1953 master plan, and housing resembled typical one or two-story houses that were designed for agricultural areas. This informal development not only broke with the landscape structure in the city, but also rendered micro-districts impossible. Hence, compared to other organized areas that were developed according to the master-plan, the informal development area lost its balance between residential units and service facilities. 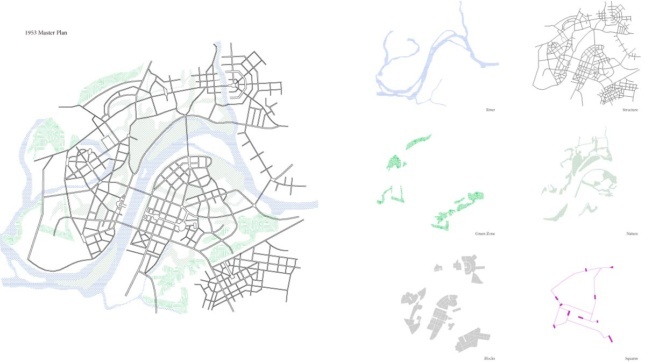 In short, the urban morphology of current-day Pyongyang portrays a mixture of the physical forms of the ideal socialist master plan and the realities of the actual development scheme. As other socialist countries have already experienced, North Korea is also in the midst of [a] transition to adopt the capitalist system in some ways. There are several indications that highlight this transition. For instance, the secretive Pyongyang government recently launched an experiment with the free market in 2002, beginning to deregulate prices and hiking salaries. Also, small vendors, which had been controlled strictly by the government, are starting to emerge at major squares, and even underground real estate deals are taking place. Collectively, these changes can be seen as early indicators of a market-oriented economic system. The former Soviet Union, its Eastern European satellite, and China each underwent this transition a decade ago, and several cities amongst them, like Moscow, Shanghai, Beijing, have already [become] booming metropolises in the world. As noted earlier, socialist cities have different urban structures and morphologies from capitalist cities. These contrasts not only reflect different political ideologies but also differences in the flow of capital. Hence, when socialist cities start to allow capitalist forms of capital flow, the urban figures also change based on this new logic. The socialist city center has been the area where most of this transformation unfolds. Because of its strategic location and superior infrastructure, most investments are concentrated in the city center. Further, public spaces or institution areas in the city center that have weaker capital power tend to be occupied by bigger capitals such as business fields. Therefore, it is the central area of the city [that] begins to morph into the central business district, something that a socialist city has not had before. In summary, the emergence of a variety of retail outlets in the form of street vendors and warehouses are undeniable indicators of Pyongyang’s economic transition, and this trend will impact the transformation of its urban morphology. For example, the more evenly distributed activities of the socialist past will become concentrated in certain areas, while denser and higher pedestrian flows will develop around metro stations, major boulevards, or squares. Moreover, new warehouse-style transactions taking place outside the city will begin affecting the structuring of suburban areas where few developments have been witnessed under socialism. Suburbanization is also connected to the restructuring of social classes within the city. In an ideal social city, there is no class segregation and [the] government strictly controls the movement of its residents. However, as social classes begin to diversify based on personal earnings within the market-oriented system, upper classes have tended to relocate to areas that have better living quality. This observation is closely related to the system of the micro-district. Aiming to consolidate areas of production and living into one space, the micro-district creates a worse environment for residents than an area that is mainly focused on residential development. Therefore, social class differentiation leads to the segregation and restructuring of programs within a city. The urban structure and layout of Pyongyang will likely shift alongside major economic transformations that have already begun to take place. It may be beneficial for Pyongyang to develop a new set of plans to reflect its transition to a market-oriented system. What growth models are open to Pyongyang? 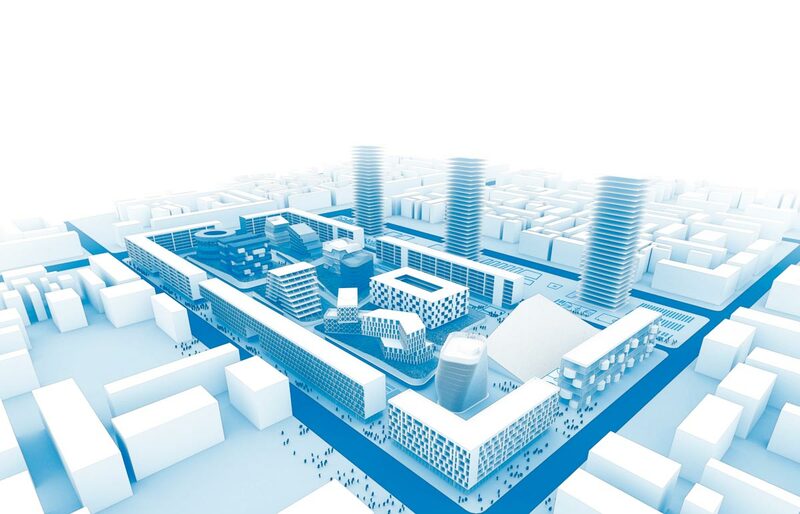 There are several possible development plans for the city. One is the “incremental growth model.” Unlike most Chinese cities, the small size of Pyongyang’s market and the gradual nature of change suggests that the city will transform step by step. 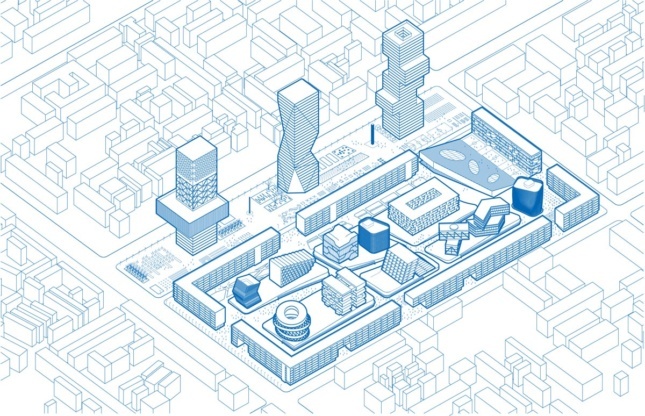 The incremental growth model differs from the ad-hoc master plan that ignores the existing socialist city structure and puts an alien structure onto the city. Just as the urban DNA of Pyongyang has resulted from the mixing of the original socialist master plan and development scheme, the incremental growth model will also be capable of forging a new DNA of Pyongyang, fusing it with its existing DNA. Thus the second questions to consider is: where would this incremental growth take place? Studies of other former socialists cities that have already been through the transition suggest that the urban mutation will occur easily in areas where the existing socialist structure and the market-oriented system collide. For instance, the area extending from the major axis of Kim Il Sung Square and Juche Tower is [a] location where socialist ideal morphology, as well as well-structured infrastructure, coexist. Because of its advantageous infrastructure and location, the area has a strong potential for attracting new investment in a market-oriented economic system. A desire to improve the residential environment will likely force production facilities, like light industries in the micro-district block, to be relocated to outside of the city; further, a new mix-used development, which is a typical development type in capitalist cities, will fill the gap. Similar types of transformation will unfold, albeit in distinct ways, in areas where informal development schemes arise. How does a new development interact with existing structures of the area? A significant difference between capitalist and socialist cities is “parcelization.” Though its distribution of programs, there is no parcel system within a block in Pyongyang, whereas the parcel is the basic element that defines ownership in capitalist cities. However, like the notion of production-consumption within a block, the physical relationship between programs is very strong in Pyongyang. Thus, when a new parcel system is introduced for the sake of the market-oriented system, instead of just dividing parcel based on existing programs, the inter-relationship of programs should be carefully considered. For example, a parcel can be composed of both production facilities and residential lots, and it can be developed as a mixed-used program. This not only ensures the maintenance of the existing character of Pyongyang as a socialist city, but also makes possible gradual development within a block instead of a whole block scale development. In short, sixty years of socialist rule, twenty-first century Pyongyang is showing early signs of change, and the developments are nothing short of unprecedented. It will usher in new paradigms, a new economic system, and a new social structure. Therefore, a new structuring of Pyongyang is needed. There may be numerous strategies or scenarios to greet this new era of Pyongyang, and the scenario of incremental growth I have outlined is one I find particularly important. Pyongyang may or may not exhibit gradual growth patterns in the future. This scenario, however, takes into consideration the existing structures of Pyongyang and anticipates how they will be shaped by a new era. Published in [UN] Precedented Pyongyang, 2017. This article originally appeared as Unprecedented Pyongyang on urbanNext. Springer, Chris. The hidden history of the North Korean capital, Pyongyang, 2003. Kim, Won. Socialist Urban Planning, 2004. Kim, Youngkyu. Tong Il Han Kook, 1988. Faiola, Anthony. Washington Post, 2004. Haaussermann, Hartmut. From the socialist to the capitalist city: Experiences from Germany. Axenov, Konstantin; Brade, Isolde, and Bondarchuk, Evenij. The transformation of Urban Space in Post-Soviet Russia. Wu, Fulong; Xu, Jiang, and Gar-On Yeh, Anthony. 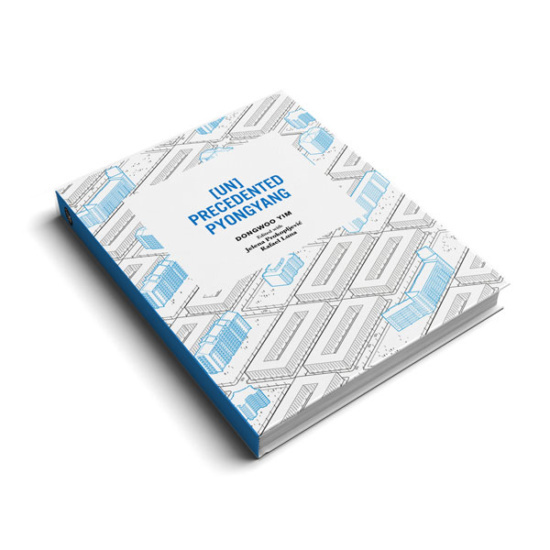 Urban Development in Post-Reform China, State, Market, and Space.